Find a Fire Performer for hire near you in minutes! Option 1. Enter your event location below & contact a Fire Performer directly! Option 2. Request multiple quotes from available Fire Performers Get Quotes! Option 3. Read information & advice on hiring Fire Performers Read Advice! WANT TO KNOW MORE ABOUT FIRE PERFORMERS? Read on for the most comprehensive guide to booking Fire Performers, including how much a Fire Performer costs, exactly what they will do at your event, plus tips, advice and information to help make your event one to remember! A Fire Performer will spice up your event with some truly daring stunts that will leave your audience stunned! What exactly will a Fire Performer do at yourevent? A Fire Performer will perform with a varied amount of props but they will all have one common ingredient: Fire! 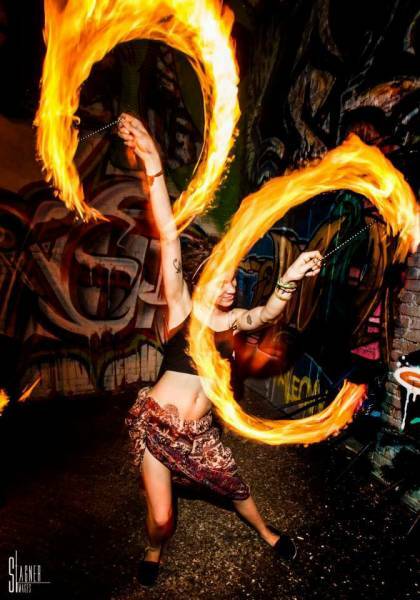 When you hire a Fire Performer, you can expect to see torched hula hoops spinning around the Fire Performers body! You can expect to see amazing juggling tricks, with all of the objects being juggled whilst on fire! You can expect to see amazing choreographed fire dancing, which is incredibly captivating to watch! And you can expect to see the most famous fire related stunt which is fire eating! Fire eating is a respected circus act that is famed the world over. When you hire a fire eater, they will breathe new life into your event by extinguishing the fire with their mouth! A fire show may also consist of pyrotechnics which is usually used during the finale of a professional fire show. Great for visually thrilling all the crowd! If you have limited space, then your hired Fire Performer can still put on a great show by fire juggling! The Fire Performer will use fuel to burn various objects such as fire torches and can juggle several at a time! When you hire two or more Fire Performers, then the interplay between them will be extra special! Another reason to hire a Fire Performer is the amazing LED glow shows that a vast amount of the Fire Performers offer as an additional service. With an LED glow show, the Fire Performer will use LED lights in a choreographed light show that will thrill your guests and may be a great alternative for smaller venues! Mainly, a Fire Performer will entertain your audience with a fantastic live show that will put the wow factor into celebrations and impress your guests, whatever their entertainment tastes may be. What event types are Fire Performers hired for? If you want a real circus feel at your wedding evening reception, then you may want to hire a Fire Performer! The Fire Performer will dazzle with an array of sparkling tricks that are not to be tried at home! The Fire Performers will impress your family and friends with famous fire skills including Fire Poi, where the Fire Performer will wave around specially shaped wicks soaked in fuel at amazing speeds! This will really heat up your wedding evening reception and your guests will be truly bowled over at the professional Fire Performers talents! Book a Fire Performer for your corporate event today! Hire a Fire Performer for your work party and it will go down in history as a scorcher! When you hire a Fire Artist, you can request to hire more that one (if you can handle the heat!) A Fire Performer can be set up on stage at your work’s annual function such as a leaving do, the end of the financial year party, Christmas party, or work awards ceremony! They will perform hot tricks whilst great music is playing, so your clients and colleagues can boogie to ‘Disco Inferno’ whilst the sparks are flying on stage! Burn baby burn! Maybe you would like to hire a Fire Performer to do some fire juggling at your trade show, product launch or shop opening? 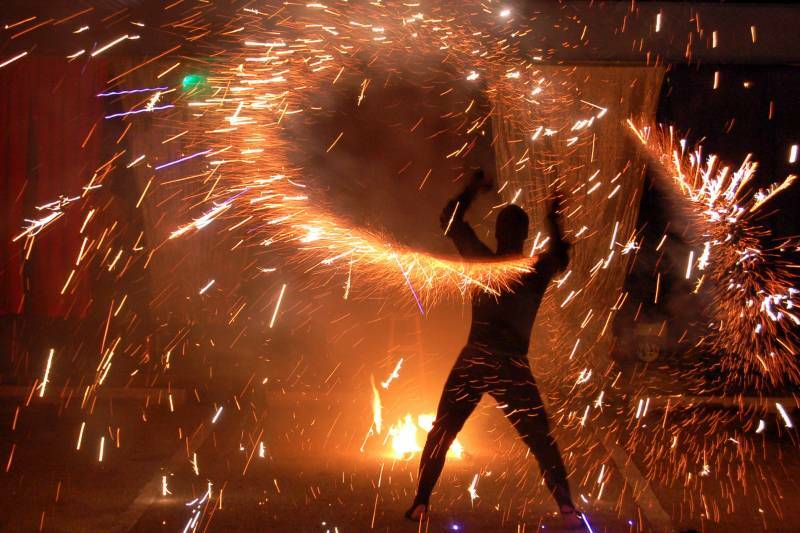 A Fire Artist is known as a big crowd pleaser and will always attract a large gathering. Want to ensure your party is blazing?! Hire Fire Performers and illuminate your party entertainment! A Fire Performer can be set up on stage or can walk around your venue, which ever you prefer. They will put on a great fire show that will consist of fire eating and fire breathing! Fire eating has so much more elements to it than you would initially think! The professional trained and insured Fire Performers listed on our site will perform dangerous and thrilling fire eating tricks such as fire transfers and fire extinguishes. You will be bewitched as the fire eater transfers a flame from one torch to another with just their tongue! Use our directory to search for Fire Performers to hire at a birthday party, an anniversary celebration, or a circus themed party! How much do Fire Performers cost to hire? Our simple to use entertainment directory allows you to firstly search for the best Fire Performers who are local (or travel to your area) and then via the contact form you may message them directly to enquire for a no obligation quote to perform at your event. Some acts will also add a rough price guide to their profile for your convenience. What are the usual set formats and performance lengths for Fire Performers? A Fire Performer can tailor their performance to times to suit you and your event, however, on average a professional Fire Performer will perform for 60 minutes. How much space will a Fire Performer need at your event? A Fire Performer will need a fair amount of space to perform their tricks for reasons of safety. We recommend hiring a Fire Performer for a stage area no smaller than 4 metres wide by 3 meters deep. This is to allow for all the props as well! What equipment and set up requirements do Fire Performers need? As with most artists who sign up to Entertainersworldwide.com, a Fire Performer will provide all of their own equipment. You may want to enquire if an artist needs a PA to amplify their sound, in which case we would advise to use our easy to use messaging service to find out. We do ask that each performer gets a backstage area in which they can prepare for the performance ahead. If your venue does not have a backstage area, then we kindly ask that you enquire with the venue to seek an alternative space in which the performer can comfortably get ready to entertain. How can you find and book a Fire Performer with Entertainersworldwide.com? WANT TO RECEIVE A RANGE OF QUOTES FROM Fire Performers?